I come to this Christmas Eve with mixed feelings. This has been one of those years when it seemed as if Christmas just couldn’t get here soon enough. I’ve felt an urgency and necessity about Christmas this year that I haven’t in recent years. And yet, I also find Christmas this year to be more challenging and difficult. Here’s why I say that. On the one hand, the angel proclaims “good news of great joy for all the people.” On the other, it’s hard to hear the angel’s voice when so much of the news I hear today is not good. And for many people and parts of our world joy is in short supply. On the one hand, I love hearing the story of how God intervened “in those days” and “in that region.” On the other hand, that’s not enough. I want more. I need to hear how God is intervening in these days and in this region, in my time and in my life. 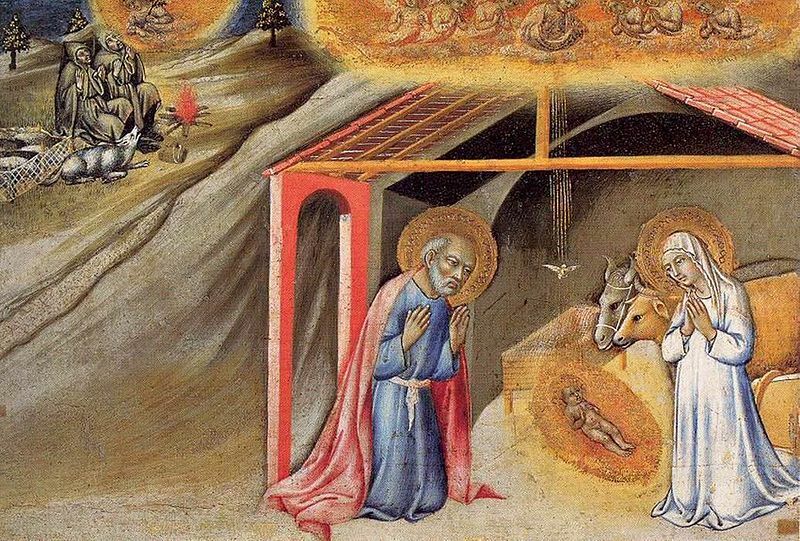 On the one hand, I want to “go now to Bethlehem and see this thing that has taken place.” I want to find the child lying in the manger and be reminded once again that it is all true. On the other hand, it seems as if all roads lead to Aleppo. I’m not talking only about the ongoing tragedy in Syria. I’m talking about the larger and metaphorical Aleppo that describes the tragic in each of our lives and throughout our world. I readily admit all those things probably say a whole lot more about me than they do about Christmas or this past year, but that’s what I bring to the manger tonight. I bring my sadness, concern, and fear for the world. I bring my shortsightedness and my inability to see the prophetic vision of Isaiah. I bring my dissatisfaction with simply hearing the story one more time. I bring a deep longing and desire to become and live the story. I bring all this and more. I don’t think I’m alone in this. I think you also bring all sorts of stuff tonight. Isaiah offered his prophecy and vision of endless peace, the destruction of the oppressor’s rod, and an end to the trampling boots and bloody garments of this world. The angels offered their songs of praise, and a message of good news. The shepherds, the first ones to go to Bethlehem, offered their wonder and curiosity, as well as their status as homeless field workers, outcasts, and the despised of society. The heavens offered a star, a waypoint, a guiding light. The inn offered a closed door: no openness, no receptivity, no welcome, no vacancy. The earth offered a manger, a feed trough to hold the Body of Christ, the Bread of Life. Mary offered her “yes,” her “Let it be with me according to your word.” She offered her pondering and treasuring. She offered her trust in a mystery that is too beautiful to be explained. Joseph, one who is too easily forgotten or ignored, offered his presence, and his guardianship and protection of God’s son and his mother, Mary. He offered them a home and security. He offered his silence, listening, and trust that God was speaking in his nighttime dreams. The wise men brought gifts. They also offered their searching, longing, and desire for something beyond and greater than themselves. King Herod offered his fear, anger, and violence. The parents of the innocent ones slaughtered by King Herod offered their grief and sorrow, their brokenness and unfulfilled futures. The whole world has been moved and affected by Jesus’s birth. All of creation has offered something. It can do nothing less and neither must we. These aren’t just characters, props, or scenes in the story. They are aspects of our own lives. They are parts of ourselves and our world. It’s not difficult to make the connections. We’ve had visions of peace and we’ve also acted with fear and anger. We’ve sung praises and followed the star searching for something new, something beyond ourselves, and we’ve also closed the doors of our life and hung a no vacancy sign. We’ve offered shelter to and been guardians of the holy and we’ve known times when we were homeless and stinky. We’ve been welcomed as the bringers of good news and we’ve also felt like an outcast. We’ve planned our future and we’ve grieved its loss. Christmas is our story. We cannot come to the manger empty handed. To come to the manger with nothing is to come as spectators of history. To bring our own stuff to the manger is to come as participants in Christ’s birth. Spectators might see God’s son born in Bethlehem but participants will experience God’s son born in themselves. That’s what I want for you, for me, and for the world. Whatever it is we bring to the manger tonight is our means of participating in the divine birth. So tell me, what are you bringing tonight? Name the hopes and fears you want met in him tonight. Name your thanksgivings and your disappointments. Recall the joys and the sorrows of this past year. What desires and longings have bought you here tonight? And what secrets make you want to turn and run? What did you celebrate this past year and what broke your heart? Whatever you offer tonight at the manger let it speak the truth of and about your life. I don’t know what you bring tonight but I know that Christ’s manger is generous enough and big enough to receive whatever you might bring. And I know that the child is strong enough and powerful enough to change our lives and our world, even when we can’t see it or don’t believe it. That’s why I continue to show up here on Christmas Eve, especially on those Christmases that are difficult and challenging. Can this child’s birth really change our lives? Well, let me ask you this. Did the birth of your child change you and re-create your world? Did your birth change your parents’ lives and re-create their world? Yeah, in more ways than we can count. So it is with the birth of this child tonight. The promise of Christmas is that we will not leave here unchanged. It might take a while to recognize and live into this change but the promise is trustworthy and true. To us “is born this day in the city of David a Savior, who is the Messiah, the Lord.” And that is “good news of great joy for all the people” in every time, in every place, and in every life. Missing worshiping at St. Philip’s this Christmas Eve. Your beautiful sermon helped me feel a part of the service. Thank you Beverly. We missed you all. Merry and blessed Christmas.